The Migration Period, an aa kent as the period o the Barbarian invasions or o the Völkerwanderung ("migration o fowks" in German), wis a period o intensified human migration in Europe frae aboot 400 tae 800 AD. Historians consider it tae be the transeetion frae Late Antiquity tae the Early Middle Ages. [citation needit] This period wis marked bi profoond chynges baith within the Roman Empire an beyond its "barbarian frontier". The migrants who came first wur Germanic tribes such as the Goths, Vandals, Angles, Saxons, Lombards, Suebi, Frisii an Franks; thay wur later pushed wastwards bi the Huns, Avars, Slavs, Bulgars an Alans. 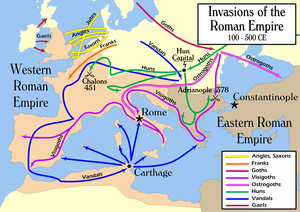 Later migrations (such as the Arab conquest an Viking, Norman, Hungarian, Moorish, Turkic, an Mongol invasions) an aa haed significant effects (especially in North Africae, the Iberian peninsula, Anatolia an Central an Eastren Europe); however, thay are ootside the scope o the Migration Period. ↑ The deleemitin dates vary; eften citit are 410, the Sack o Rome bi Alaric I; an 751, the accession o Pippin the Short an the establishment o the Carolingian dynasty. ↑ Bury, J. B., The Invasion of Europe by the Barbarians, Norton Library, 1967. This page wis last eeditit on 25 Mairch 2015, at 06:15.